For over 10 years ZEDOnet has developed hiqh quality printer drivers which are distributed under the product names "TurboPrint" (Linux) and "PrintFab" (Apple Mac OS X & Windows). Our portfolio not only covers printer drivers but also software components for printer setup, printer monitoring, usb or network drivers and printing APIs. Perfect color reproduction is ensured by our professional color management which adjusts color application individually to printer, ink and paper. We are looking forward to receiving your inquiry for driver development. Describe your requirements to us - we wil be pleased to work out a solution for you. 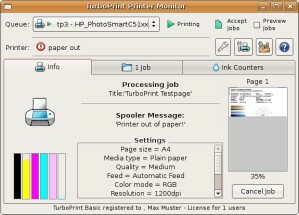 Development of tailor-made OEM printer drivers e.g. for security printing with special inks. Individual control over ink tanks allows to reuse light cyan & light magenta cartridges for UV inks - regular color printing with CMYK inks is still possible. Generic postscript drivers for MS Windows with customized extensions (identical driver for all postscript printers that is reconfigured with a PPD printer description file). Language monitor / print monitoring: retrieve status information like ink levels / consumables, warnings and error conditions like "out of paper"